With the sad news of Sue Light’s death (on 15 July) still so much in our minds there is some comfort to be taken from hearing her and Professor Christine Hallett being interviewed on Woman’s Hour in July 2014. You can hear it here. 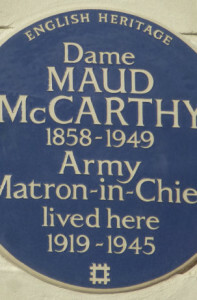 The interviews, which were about the recently-unveiled English Heritage blue plaque for Dame Maud McCarthy, begin at 11 minutes into the programme. 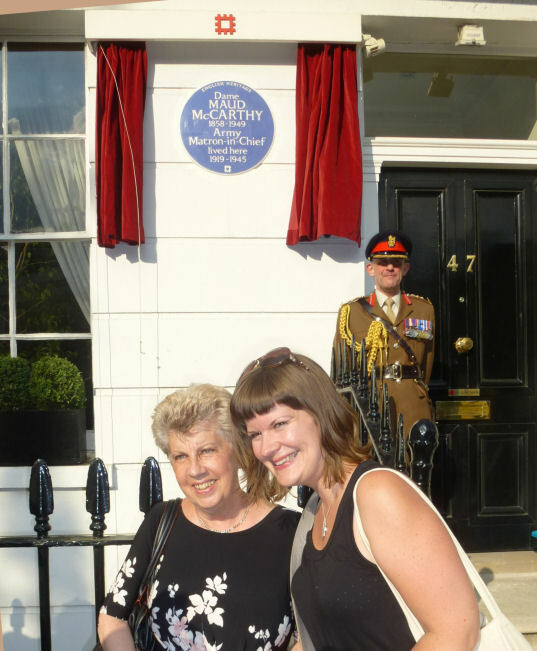 On Tuesday 24 June 2014 we were privileged to be present at the unveiling of a blue plaque outside the London home of Dame Maud McCarthy from 1919 to 1945. 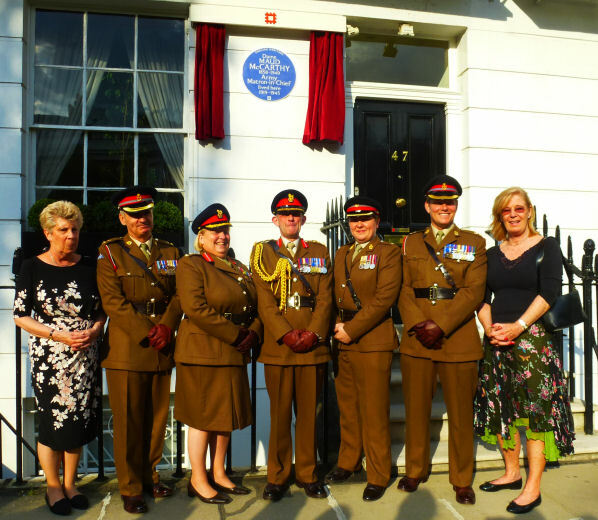 It was a beautiful day and we enjoyed meeting a number of currently serving members of QARANC (Queen Alexandra’s Royal Army Nursing Service). Here she is, looking very happy at what she had achieved, together with her daughter, Hannah. 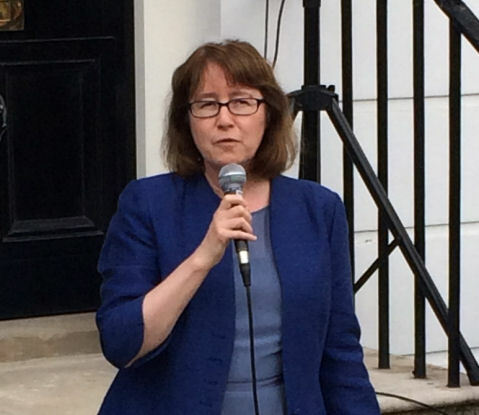 Congratulations to Sue Light for originally proposing – six years ago – the erecting of a plaque. Read her account of the unveiling together with some photos here. We feel that our great aunt Edie would have been proud. She remained in contact with her boss after the war and, who knows, she might even have visited her here in Markham Square. Here below are a few pictures of the event. Click on the images to enlarge. The English Heritage blue plaque. Click here for an article on the EH website. Sue Light (left) together with QARANC officers, led by Col. David Bates, and the current owner of no. 47 Markham Square, Penelope Russell (right). 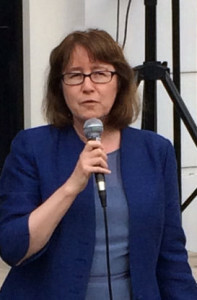 Professor Christine Hallett who spoke about Dame Maud’s life. Click here for another article about the event. Sue Light has put together an item on her blog about the departure of Dame Maud from France on 5 August 1919. It’s here: http://greatwarnurses.blogspot.co.uk/2013/02/leaving-france.html. Edie had been working directly as part of Dame Maud’s team in Boulogne since February 1919 and I’d love to find Edie amongst the crowd in the quayside photos of the departure; so far no luck. 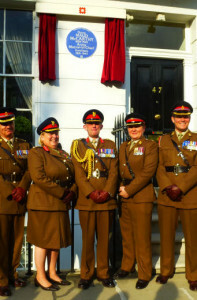 Excellent news: English Heritage have agreed to erect a blue plaque at 47 Markham Square, London SW3. 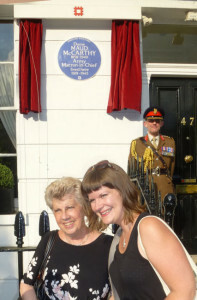 In May 2008 Sue wrote to English Heritage to propose that a plaque be placed on one of the two houses in Chelsea that was home to Dame Maud McCarthy. When I saw this initiative on Sue’s blog I wrote to English Heritage to support the proposal. On 1 November 2008 Sue updated progress here. We are keeping our fingers crossed but it may be some time. There are several references in Edie’s diaries to ‘Miss McCarthy’ and ‘Miss McC’. 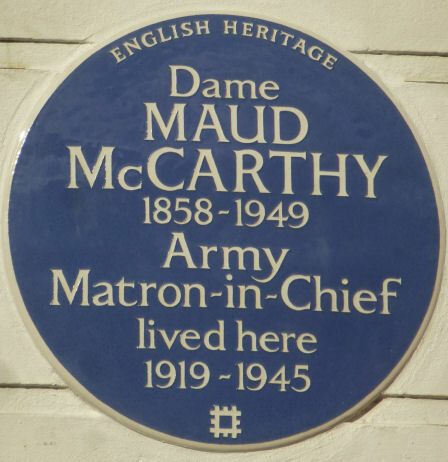 Maud McCarthy was Matron-in-Chief of the British Expeditionary Force and Edie clearly had great respect for her. Family memories have it that Edie stayed in France until well into 1919 and was responsible for repatriating Canadian nurses. However, thanks to the wonderful Sue Light, we now have copies of Edie’s papers and official records and these show that she joined the staff of the redoubtable Dame Maud McCarthy in Boulogne in February 1919, remaining there until her demobilisation in December 1919. Sue Light has done an amazing job of making available the diaries of Maud McCarthy and you can see them here. On 17 June 1917 (click here for relevant page) Dame Maud writes in her diary as below. This is a particularly interesting piece of information as the date falls in a period (16 November 1916 to 20 June 1918) for which we have no diary of Edie’s; the entry reveals that she was at 45 CCS which was located at Achiet-le-Grand between April 1917 and March 1918. 45 CCS: Received letter from Sister Appleton, in temporary charge of 45 CCS, to say that the hospital had been quite busy and shells had been falling very near. The hospital cook and a patient had been wounded. The patients and staff had had to go to dug-outs. Miss Blakely left to report at the War Office. Miss Appleton QAIMNSR who has been out since the beginning of the war and who is a woman of considerable experience, is working temporarily at the Principal Matron’s office until the arrival of Miss L. E. Mackay. But clearly the Matron in Chief, who replied on 18 August, was persuasive and by 23 August Edie had agreed to join! The Australian Dictionary of Biography has a page on Dame Maud here. 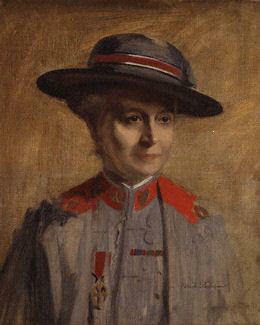 There’s more information about that charming portrait (above) of Dame Maud in the National Portrait Gallery in London. You can see it here.